Home Biafra featured BIAFRA; IPOB IS ONE, UNITED, STRONGER AND FOCUSED UNDER MNK. BIAFRA; IPOB IS ONE, UNITED, STRONGER AND FOCUSED UNDER MNK. I ''ll like to state it clear that there is no such thing like infighting in IPOB under the leadership of MNK and there is also no such thing like Biafra fighting themselves as few ignorant people are insinuating. And am calling on those who are campaigning For IPOB to forge a United front with some miscreant and power mongers who's their only interest is not for restoration of Biafra but to hijack power, and monetized Biafra Restoration for their fame and selfish interest, to as a matter of urgency rethink and redress their step from such dangerous sympathetic campaigns . Any individual or groups no matter how sweet his or her tongue may sound, and claim that he is genuinely fighting for the restoration of Biafra and yet do not acknowledge the very fact that Mazi Nnamdi Kanu the leader of IPOB world wide and his followers has through their ideology of selfless services towards Biafra restoration, brought the once but forgotten country back to live with our intellectual warfare against this British contraption called Nigeria more than the mind can imagine with our peaceful demonstration and civil disobedience as internationally recognized way of agitating for self determination even in the face of death in a primitive country like Nigeria. And still feign ignorant that why the zoo called Nigeria is sinking everyday by day is because of the efforts of our people both home and in diaspora, who have laid down their lives and finances and has succeeded in keeping the sit of power in Abuja restless through our resoluteness in face of death for the freedom of Biafrans. And keep making mockery of the sacrifice of our falling heroes just to destroy IPOB and her supreme leader MNK, most be an agent of Hausa-Fulani led Federal Government of the zoo called Nigeria . 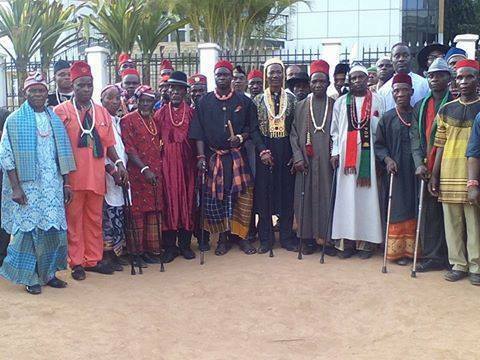 IPOB Indigenous People Of Biafra are people of Biafra not organization. And Biafrans has chosen their leader in the person of Mazi Nnamdi Kanu . And it's evidently clear to the whole world that at the order of MNK all Biafrans abide. 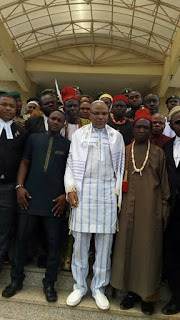 And this is why genuine people and groups with biafra restoration at heart has already identified with IPOB under MNK and endorsed MNK as supreme leader of IPOB world-wide in honor of his selfless service and achievement towards Biafra restoration ,examples is Mazi Uchenna Madu led faction of MASSOB and hosts of other genuine pro Biafra groups. Is that not enough to understand that IPOB has forge a common front and are unstoppable on our quest to restore Biafra? MNK despite reliably given the highest authority by Biafrans. He has shown to be humble, and exemplary leader and who always ready to listen to superior augment and allow the superior augment to always win a debate in respective of who brought it. Is that not enough for any acclaimed genuine groups or indiviual with interior motive to follow suit and bring up what ever is their idea they claim to have so it can be debated and be initiated to bring Biafra restoration faster. To identify with IPOB like others did instead of trying to destroy IPOB. And still cunningly claim you are for Biafra restoration Like the way the so called LNC, RBI, OYI, LONIM, SOJ being pioneered by So called Tony Nnadi and suspended seven men 'DOS'. IPOB under the leadership of MNK has a proper laid down principles that has brought Biafra Restoration to this far, of which these miscreants that are claiming to know it all with their so called road map to Biafra referendum which is actually a blue print handed over to them by MNK once commanded . And can not feign ignorant of IPOB principles. During their reigns in IPOB we all know how they enjoyed the command and control policy of IPOB without restrictions,they were respected and obeyed as leaders, there was no complain about such policy by them because everything were perfectly on their favor . They identify themselves with their respective posts they also acknowledge MNK as their leader and Alphonsus Uche Okafo Mefor as the deputy leader of IPOB , they do announce the removal of any principal officer that is found wanting at their order on air .They were brought to lime light . Biafrans fell in love with them and everyone were singing their praises,our singer's Biafran musicians were not left out. Then something happened they felt with enough publicity that Radio Biafra London has given them and the leader of IPOB is still in prison being incarcerated by the zoo and offers are flying up and down by the Zoo Federal Government to quench the agitation but all met a deaf ear by the leader of IPOB MNK and his deputy. They felt it's time to plot against our leader and his deputy so they can hijack the power and have a field day to destroy Biafra restoration . But to successfully achieve this they needed a Mic to derive in their aim as its very clear the only way they can succeed is by poisoning the mind of Biafrans against our reliable and trusted leader MNK and his Deputy, hence insisting on establishment of a different radio station without official approval of the highest command in which they are to obey as the principle of IPOB demand. The same principles of command and control policy which they have been enjoying all these while . Then when the ax turned against them as protocols demand, and a simple order was given to them to shutdown the radio station. Instead of to obey the last order and led by example and wait until official approval if need be because of the interior motive behind the establishment of the RBI they refused to obey the command and hijack everything on their disposal for Biafra restoration including a well equipped mission house of IPOB in Spain. An office that was financed by IPOB worldwide and cash on their disposals including a blue print of the Biafra restoration handed over to them. And they are now hell bent in seeing that IPOB are being destabilized under the sponsorship of the zoo government . They fabricate lies against IPOB and MNK and his Deputy Mazi Uche Mefor and sell to the zoo media. With their latest propaganda of announcing that MNK is sacked by IPOB which the zoo media were spreading is a clear indication that their hand are already oiled by the zoo government yes money have changed hand and they are in desperate move to fulfill the agreement of their pay masters. It's of public knowledge that MNK during his radio broadcast in London made it clear that he has plan A B & C to get Biafra restored. While he have all three plan his Deputy have only two at his disposal , Then the DOS have just one of it which probably is the so called road map to referendum which they are campaigning and trying to ride on the success of IPOB under MNK thereby trying to reap where they did not sow. It's no longer news that IPOB under MNK is peaceful freedom fighter movement agitating to secure a United Nations supervised referendum from Nigeria government or United Nations Mandated referendum to determine the future of Biafrans in the presents day Nigeria and our weapon is civil disobedience and peaceful demonstration which is a civilized and internationally recognized way of agitation. And this is what has kept Nigeria government in panic having seen that MNK have sensitized all Biafrans and that Biafra can't be quenched with the barrel of gun any more, as they have tried every possible means to quench the agitation or stop radio Biafra London from broadcasting all to no avail. They resulted in floating a new radio station with some miscreants in USA who's their interests is their pocket . The strategy is to destroy IPOB and MNK and finally kill our quest for referendum. And to successfully achieve this they have to sell their own type of fake road map using the same referendum while they use their media attack dogs to destroy IPOB with falsehood and blackmail. The truth is that having carefully studied what they called their road map to referendum IPOB under MNK have successfully met 99% of the requirements and are just waiting for a date to be announced. In terms of unity IPOB has United all part of Biafra land, may 30, 2017 BIAFRA memorial day sit at home order by IPOB and Anambara election boycott and sit at home order by IPOB is enough proof that all part of Biafra land are now speaking with one voice under the command of MNK and it's also enough proof that we already have 98% sensitization to our people towards the up coming Biafra referendum. And this the only reason why they come up with their road map to Biafra referendum with exactly what Biafrans under MNK has already accomplished. To sweet mouth the gullible and ignorant once and divert their attention to their mission of destroying the success already recorded by IPOB. Because the only way they can rise is to destroy IPOB by blackmailing MNK with falsehood so Biafrans can turn against their leader and by doing so the quest for Biafra will die a natural death , For the reason they are under the payroll of the zoo government.